Happy Monday to You!!! I hope you had a good weekend!! It's Wanda here today to share an easy Christmas card. Be sure to click on the pictures to bring them up larger. I'm using Quietfire's fabulous stamp - May Your Longest List This Christmas. 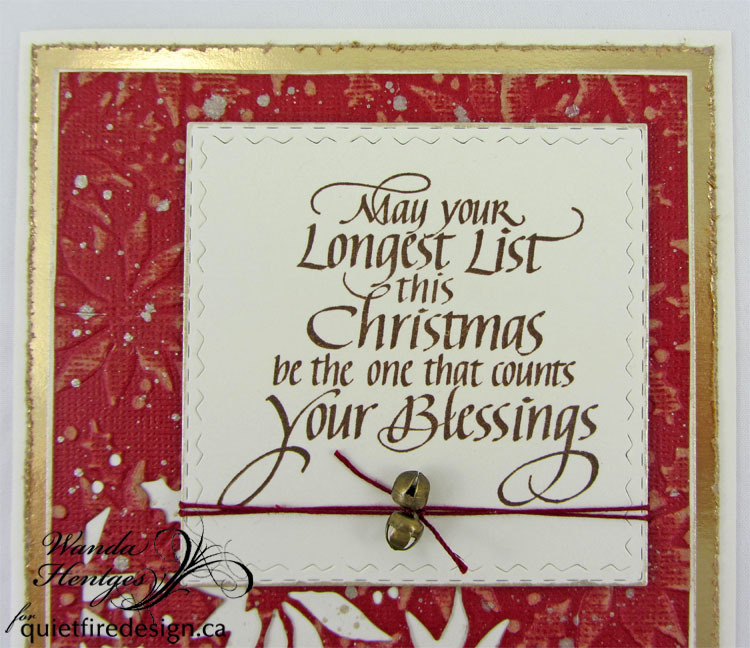 It is stamped onto cream card using Archival Ink Potting Soil and then die cut with a Stitched Square cutting die (Tim Holtz/Sizzix). The edges of the square are sponged with White Fire Fresco Finish Paint (PaperArtsy). The square is wrapped with Craft Thread (Tim Holtz/Eclectic Elements) that I've tied a couple of bells (Tim Holtz/Idea-ology) onto. The background is super easy. Cut Kraft Core paper (Tim Holtz/Core'dinations) to fit the Poinsettia Embossing Folder (Tim Holtz/Sizzix). Emboss the panel. Sand the paper to expose some of that Kraft Core and to bring out the poinsettia more. 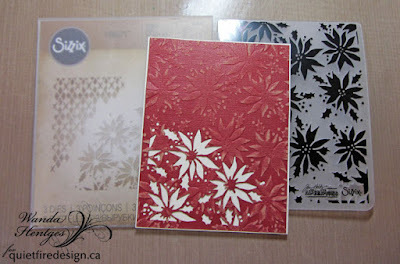 Die cut the bottom left corner with the Poinsettia Mixed Media die (Tim Holtz/Sizzix). Attach this panel to a cream colored panel leaving a small edge. Splatter with White Fire paint thinned with water and then sponge White Fire around the edge. Onto a folded cream card, using double stick tape, attach a piece of Kraft Core Metallic Gold that you've distressed the edges on. Attach the background panel using foam tape. Attach the quote panel using foam tape. You now have a beautiful, elegant Christmas card!!! Thanks for following along!! I hope you have time to get crafty this week!! 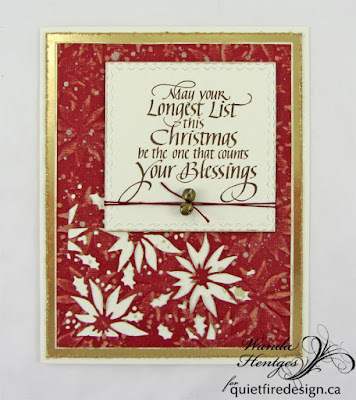 What a stunning card and super sentiment! I just love how well everything is tied together, colors, lay out and embellishments.